Recall to Repair of Paloma, Rheem, Ruud, Rheem-Ruud, and Richmond indoor tankless water heaters manufactured from May 2004 through December 2006. 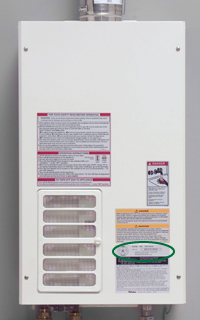 In the United States, in cooperation with the United States Consumer Product Safety Commission, and in Canada, in cooperation with CSA International, Rheem Manufacturing Company (Rheem) and Paloma Industries, Inc.have voluntarily initiated the Recall to Repair because certain components inside the water heater may shift during transit, causing an air filter door switch to operate improperly. If the switch fails and the air filter door is out of place, the water heater may continue to operate and dust and lint could build up, posing a carbon monoxide poisoning hazard. In both the United States and Canada, Rheem is providing the free repair service for all brands subject to the recall. We will repair your tankless water heater at your location free of charge. Please call our toll free hotline to schedule a free onsite repair. Search for your model number and serial number to see if it is affected by the recall. Paloma, Rheem, Ruud, Rheem-Ruud and Richmond.